Pick a roomy tote that has enough space to fit larger necessities like your towel. An inside, zip-able compartment is ideal for storing essentials such as your ID or cash. If you’ll be flying to your destination, your beach bag can double as a carry-on. The rays in the Caribbean are a lot stronger than the ones you enjoy at home, so grab waterproof sunblock with at least 30 SPF and don’t forget to reapply. 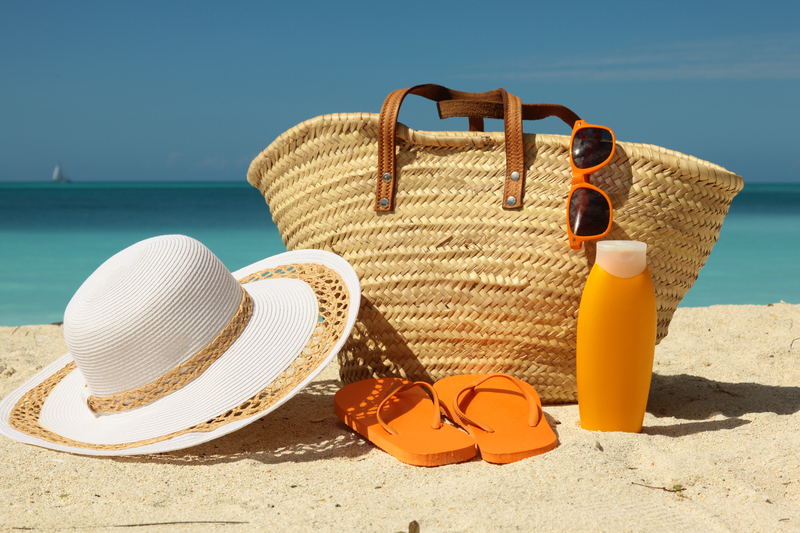 Store your bottle of sunscreen in a cosmetic bag to prevent it from spilling onto your other belongings. Small zip lock bags can shield your cell phone and camera from water and sand, while larger zip lock bags are great for storing wet bathing suits. Just because your sunglasses are dark doesn’t mean they’re protecting your eyes. Pick a pair that has UV-blocking lenses. Bring a couple of bottles of water. Salty air has a habit of making beachgoers quite parched, plus, it’s always important to stay hydrated. Many resorts provide towels for guests to use, but if you’ll be toting a towel along, choose one made of lightweight material so it dries quickly and doesn’t take up a lot of room in your bag. When there’s a long line at the rinsing station, baby powder is surprisingly handy for removing sand from your skin. Dust the area that’s covered, brush it off, and make your sand-free getaway. Magazines are always a good choice for keeping up on the latest information and gossip, but nothing beats a good book. Don’t forget to stash a pair of travel-friendly headphones or a beach-approved speaker in your bag so you can chill out to some good beats. Ready for a sunny escape to the islands? Contact your travel agent and make sure you pack this list.